This dispatch is dedicated to the memory of television star, celebrity chef and celebrated author Anthony Bourdain, who was found dead this morning in France as the result of an apparent suicide. Anthony’s curiosity and insatiable appetite – for food but also for human connection and new cultural experiences – were an inspiration for many including this restless misfit. He is missed. May he rest in peace. If you are having suicidal thoughts, please call the National Suicide Prevention lifeline at 1-800-273-8255 or go to speakingofsuicide.com/resources. It was the best of times. It was the worst of times. It was the age of the tech boom and the green revolution. It was the age of uncertainty in the mineral extraction industry. Denver shimmers in its newfound glory. Cheyenne persists. Though separated by a mere 100 miles, the drive from the capital of suddenly resurgent Colorado to that of staunchly conservative Wyoming is like a trip back in time, once one makes it through the sprawl that seems to stretch from Denver most of the way to Fort Collins, the last Colorado city. Then miles of grassland that continue beyond the state line, interrupted by billboards touting the western history of Cheyenne and a large fireworks store. Then a few houses, a few more, and then Cheyenne. The site of what would become Cheyenne was chosen as the point at which the Union Pacific Railroad would cross the Crow Creek, a tributary of the South Platte River. The railroad reached Cheyenne in November 1867. The new city, named after a prominent Native American Tribe, grew rapidly from a little over a thousand in 1870 to more than 11,000 by 1890 and more than 30,000 by 1950. Approximately 65,000 people call Cheyenne home today. It remains Wyoming’s most populous city and hosts the annual Frontier Days, billed as the world’s largest outdoor rodeo and celebration of western culture. 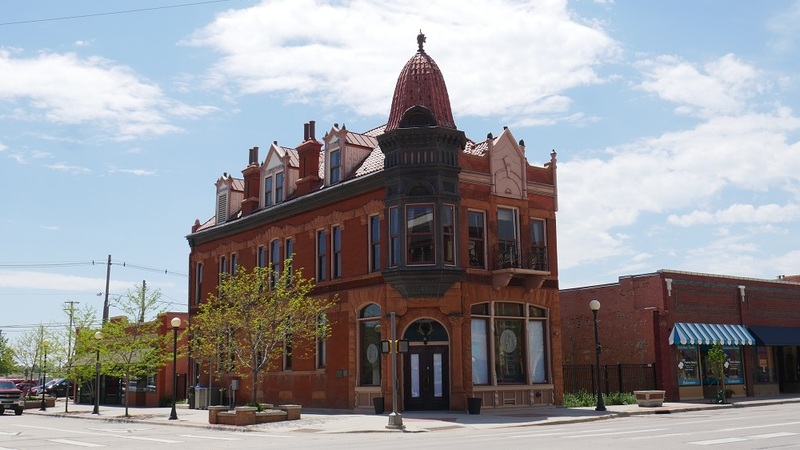 Cheyenne is also home to the Plains Hotel, built in 1911 a stone’s throw from the train station. The hotel served as lodging for exhausted train travelers and cowpokes, included multiple restaurants and meeting rooms and a grand lobby. By the time we made it to the “historic” hotel in 2017, the creaky floors had warped and the rickety old elevator – supposedly made small to prevent out-late cowboys from trying to bring their horses up to the rooms instead of paying to set them up in the stable – malfunctioned often enough that the similarly worn yet gregarious maintenance man merely cursed the wretched box with resignation and started tinkering when it went down during our visit. One of our rooms faced a brick wall. One lacked soap. A fellow traveler had to ask for toilet paper. On a subsequent visit the elevator, while still slow, appeared to have been repaired, but the carpeted fitness center had lost its sole treadmill. And yes, I stayed again. 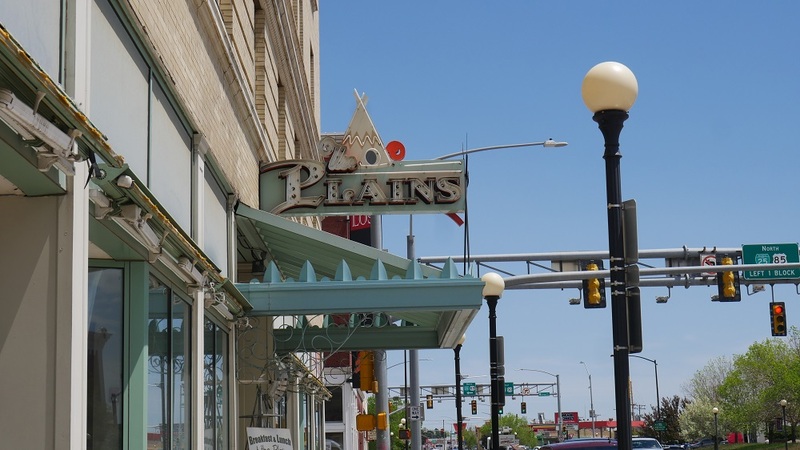 The Plains is the only even halfway decent hotel downtown. The sign outside the door, resplendent in the picture on the website, appeared worn during the daytime. The hotel boasted of renovations done a little more than a decade ago. I wondered at the state of the rooms before the renovations while staring at the fraying arm of a lounge chair, covered in a repeating pattern of buffalo while truck after truck loudly revved their engines while driving over an overpass outside my window. But the hotel, like the city, retains a stoic air. The impressive lobby, outfitted in western style with old paintings including one of cowboys making camp in the fields outside the city and myriad other knickknacks, promises a relaxing and dignified stay in the midst of a great adventure. I wonder if most if not all the renovation money went into the lobby. Behind the front desk stands a painting of a Native American man with long dark hair and a stern look. A depiction of the man’s face adorns doorknobs, room number signs and a tiled piece of art outside a side door. 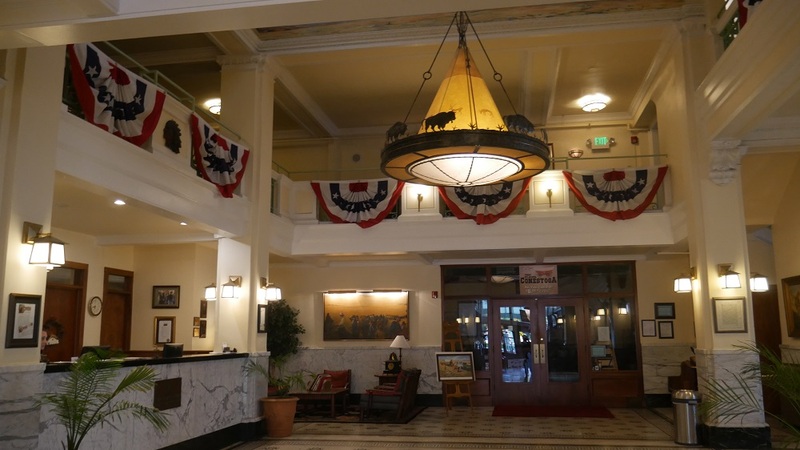 He is reportedly Arapahoe Native Chief Little Shield, who brought many of his people to the city in 1915 to enjoy Frontier Days, during which he visited the hotel. The hotel cites a legend that says the hotel owner found the man so handsome that he had a local photographer take his picture. Years later an artist created an oil painting from the picture. The painting hung in the lobby for 50 years until it disappeared one night. Twenty years later a new owner acquired the picture – the hotel doesn’t mention how or where it had been – and hung the painting again. When we asked the front desk clerk about it she said the man in the picture was an early employee. We asked what kind of employee. I didn’t get the impression she was messing with us, but perhaps. A block away from the hotel stands the shuttered Atlas Theater. 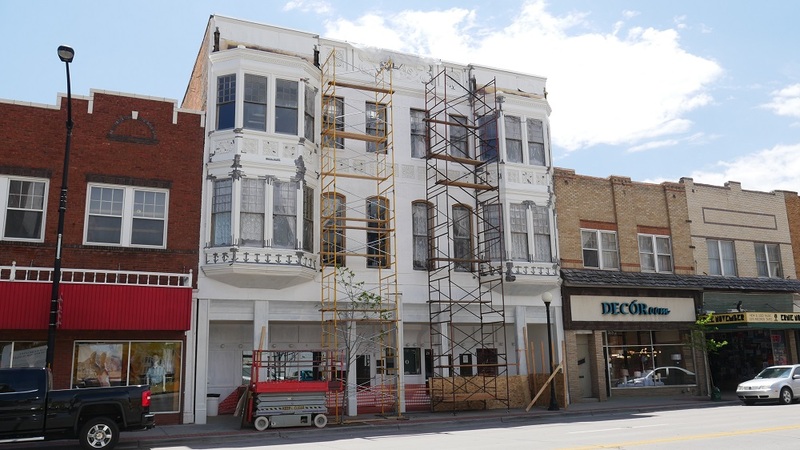 Scaffolding on the outside hints at renovations. Billboards across the street plead for donations to save the theater, built in the late 1800s. A slightly newer but weathered theater on an adjacent street is closed with no signs of life. A bit further away lies the state capitol building, its tower covered, the grounds one large construction zone. The government offices are spread throughout the city, many in a shimmering glass building that once housed a credit monitoring company gone broke, a perhaps poor design choice in a city subject to the occasional brutal hail storm, as one job applicant remarked. 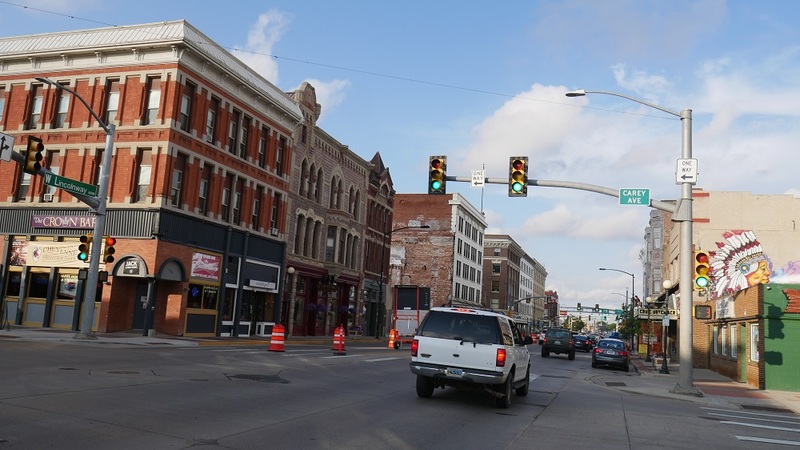 “A very conservative city in a very conservative state,” as the same applicant put it, the leaders of Cheyenne seem content to let it remain as is, though some attempts at innovation are being made. The job candidate talks about how the current governor, Republican Matt Mead, tried to diversify an economy largely dependent on revenues from oil and mineral extraction by, among other things, securing contracts to build supercomputers on the edge of town. The near-constant winds blowing across the plains cool the computers. But the supercomputers don’t require many workers. The winds make the perfect climate for setting up wind turbines, but a lack of infrastructure to distribute the power renders most would-be schemes uneconomical, according to the applicant. on diversifying, and she comments that most legislators in the state seem to want only to cling to the historic revenue stream. Though billboards for gubernatorial hopefuls dot the freeways, most lack any details beyond the name of the candidate. But one stood out. At a local watering hole and restaurant, a bartender with a long thin beard, shoulder-length bleached-blond hair and pierced eyebrows talks about a music class he teaches as a volunteer at a community center. A fellow patron asks him why he bothers, and he replies that since the schools cut music programs somebody has to teach the kids. When another patron laments how hard it is to get good acts to play in Cheyenne, the bartender says it shouldn’t be. Ideally situated on one freeway that connects to Denver to the south and Montana to the north and another that stretches from Teaneck, New Jersey, in the east to San Francisco, California, in the west, the bartender proclaims that many bands pass through Cheyenne. It shouldn’t be hard to get them to stop. But lest my criticism of Cheyenne paint too bleak a picture, let me set the record straight, dear reader. This bureau chief has been dispatched to many a more derelict location, and to be fair, multiple fairly new hotels share a block one mile from the city center. Varied drinking and eating establishments abound downtown, including two excellent craft breweries – one in the renovated train terminal – and a decent steakhouse. Tree-lined streets run through neighborhoods of modest houses, dotted here and there with stately old mansions. The people are for the most part polite and friendly, eager to talk and help and laugh, and occasionally poke fun at a clueless visitor from California. And I imagine Cheyenne is quite the different scene during Frontier Days. I left town with the impression that Cheyenne in particular and Wyoming in general are at a crossroads. With the fossil fuel industry in the midst of what might be one last hurrah before the market recognizes the necessity of investing in the renewable energy revolution, one fears the abyss. 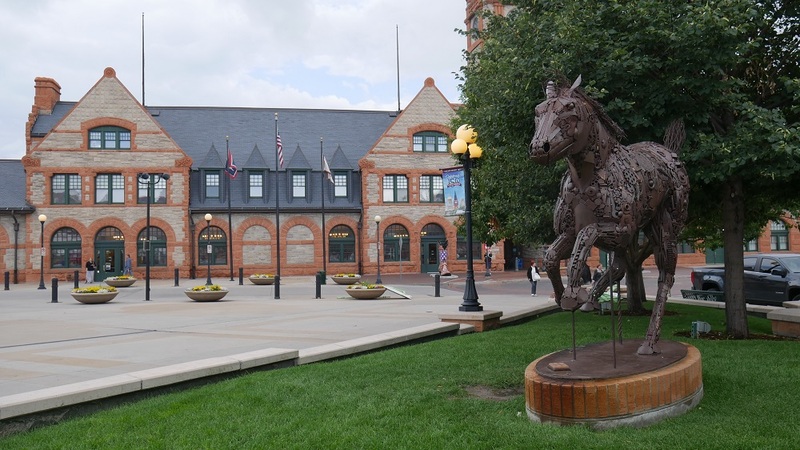 But Cheyenne is well-situated to take advantage of its history, location, the infrastructure of its downtown and relatively low cost of living. The question is whether the potential will remain untapped. My hiring and training completed, I headed south to Denver, a city in the midst of what seems to be a complete overhaul. This tale of two cities will conclude next month. But first I had to make it through the traffic. Courthouse News Service has provided daily coverage of the United States District Court for Wyoming for more than a decade. 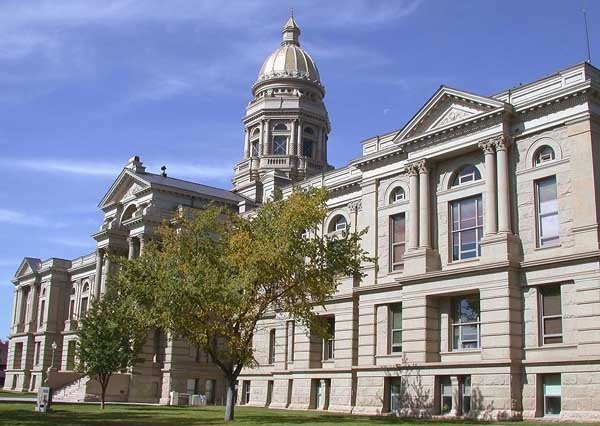 CNS began regular in-person coverage of Wyoming state courts in 2017, including in the counties of Laramie, Natrona, Campbell and Albany. Interesting Fact: Laramie County is the least populated county in the United States that is the most populated county in a state.